This is a touching image of the groom and his son I took during a Black Creek Pioneer Village wedding reception right in front of the venue. Although this wedding photo was the captured not too long ago, it has a timeless look. 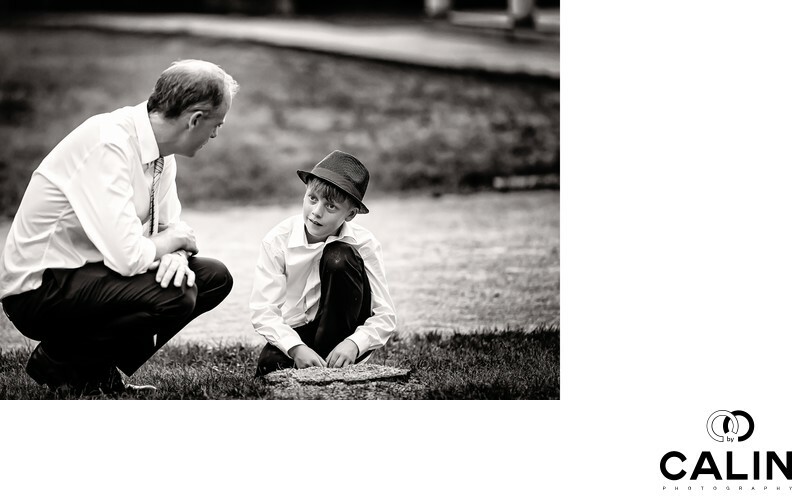 The groom's son is wearing a hat in this image and is playing with a rock, while his father is crouching next to him. Great candid photos like this do not just happen. To be able to create this picture, during the reception, I followed the groom around and noticed that he went to talk with his son. As such, I grabbed a long lens and that allowed me to shoot without altering the big day's events. Unaware that I was photographing them, the father and son shared a beautiful moment that I managed to capture. Despite the fact their conversation took only a few minutes, this will bring back memories of that wedding day decades from now. Such is the power of wedding photography. What makes this picture special? First, the beautiful moment is masterfully captured. Second, the shallow depth of field created by using a long lens makes the subjects stand out. The background melts in a beautiful bokeh isolating the subjects of this image: the groom and his son. Next, the black-and-white processing is impeccable and contributes to creating a timeless photograph.